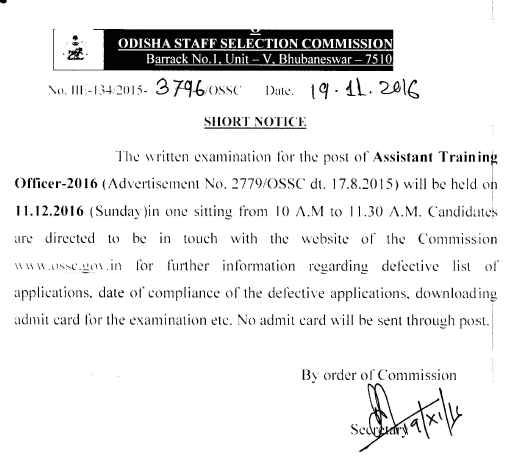 Odisha Staff Selection Commission (OSSC) will organize Assistant Training Officer (ATO) on 11 Dec 2016. The test is to be held as per selection process of advertisement no. 2779/OSSC dt. 17.8.2015. It will be organized in one sitting only from 10:00 am to 11:30 pm. Now OSSC ATO Exam Admit card are going to be released around 7-10 days prior to exam date through online mode at ossc.gov.in. You have to remember your registration details to download them. 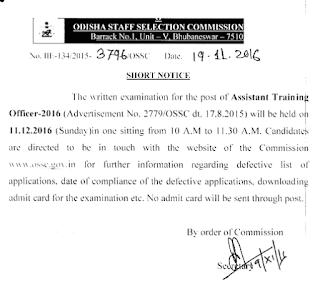 Odisha Staff Selection Commission is going to conduct written exam on 11.12.2016 for Assistant Training Officer posts. For that, admit card are going to be released soon. You can download OSSC ATO admit cards from below link via the official website ossc.gov.in. No admit card will be sent through post. Odisha Staff Selection Commission had invited online applications for 352 ATO posts under Director Technical Education & Training (DTET), Odisha, on contractual basis. The written test is to be held for finding eligible candidates for these posts. The exam date is announced and the test is scheduled on 11.12.2016. The admit card is going to be available at below link. LIST OF DEFECTIVE APPLICATIONS ALONG WITH GROUNDS. NOTICE REGARDING LIST OF DEFECTIVE APPLICATIONS ALONG WITH GROUNDS. Separate examination will be held for ITI and Degree / Diploma MCA candidates. The commission shall upload the admission letter of the admitted candidates on its website ossc.gov.in. Candidates have to visit the website and click on the "candidate login" button and then provide user id and password upon which the status of the application will be displayed on screen. Eligible candidates can download the admit cards by clicking on "download admit card" button. In order to download the admit card for OSSC ATO exam, visit the above link and on the download page, enter your user id and password. Your OSSC ATO Admit card 2016 will be shown and you have to take the printout.